Currently, we are not allowing undergraduate students to create their own sites. However, a faculty or staff or graduate student can add an student to his or her site and assign a role of editor, author or contributor, thereby allowing the student to participate more fully. Add Existing User – this is for adding users to your site site who are already using the UCI Sites system in other capacities. 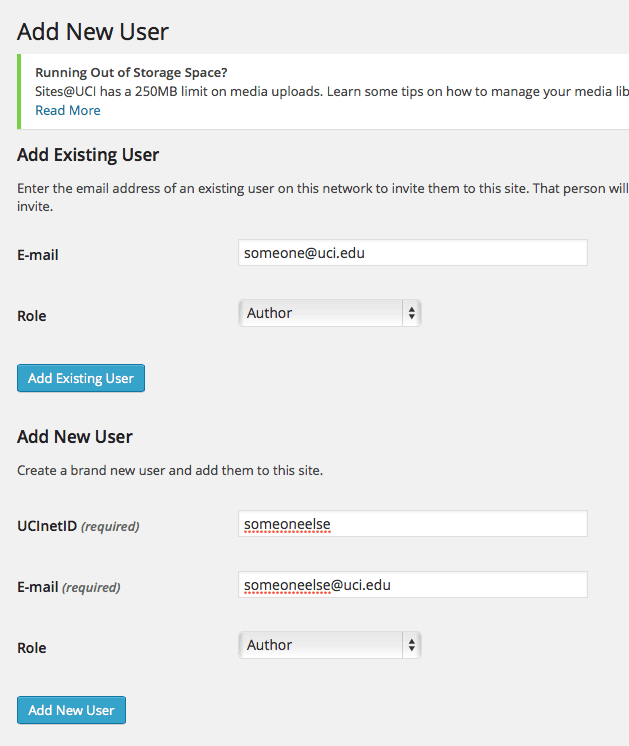 Add New User – this is for adding users who are brand new to UCI Sites. A flash message at the top of the panel will tell you that your user has been added. Alert: If you cannot add a new user and receive the following error message “Sorry that username already exists!”, the person may already have an account. Try using the Add Existing User option. If that doesn’t work, he or she may be using a My.Name email address. Check the UCI Campus Directory and verify that the UCI email address you enter matches what is shown for your new user. For example, you may need to use “samuel.someone@uci.edu” vs. “someone@uci.edu”. An e-mail invitation will be sent to your new user with a link to confirm the invitation. When your invitee clicks the link, they will be added to your site using the role you assigned. 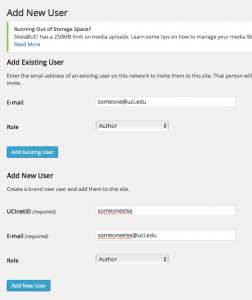 Your user will also be given links to the site and the option to log in. If you invited someone to be a member of your site and he or she never receives the email or you have other problems, please contact us. Sometimes the invitations get lost in spam filters. We can help sort things out. In the Admin Panel, click on Users > All Users. The administrator of the site can change a user’s role to increase or decrease the capabilities. OIT will not change a user’s role without the administrator’s permission. If you do not know who the administrator is, contact the OIT Help Desk and we can help you find out who the administrator is. Check the box next to the person for whom you want to change the role. Select the desired role from the “Change role to” drop down menu.